Follow the 80/20 Lifestyle and Get Healthy – Even During the Holidays! One of the top strategies that helped me lose weight and keep it off is the 80/20 Lifestyle. This refers to simply eating clean, healthy, whole foods in appropriate portions 80% of the time, and allowing yourself some indulgences occasionally, or 20% of the time. For me those are things like wine, cheese and ice-cream. It is what you do on a regular basis that matters most so when you do indulge a little bit, it doesn’t set you back. The 80/20 Lifestyle enables you to manage your weight, even when you are at a party, or dining out with friends or colleagues. It works because you are not depriving yourself of the foods you love and it helps to erase that “diet” mindset. 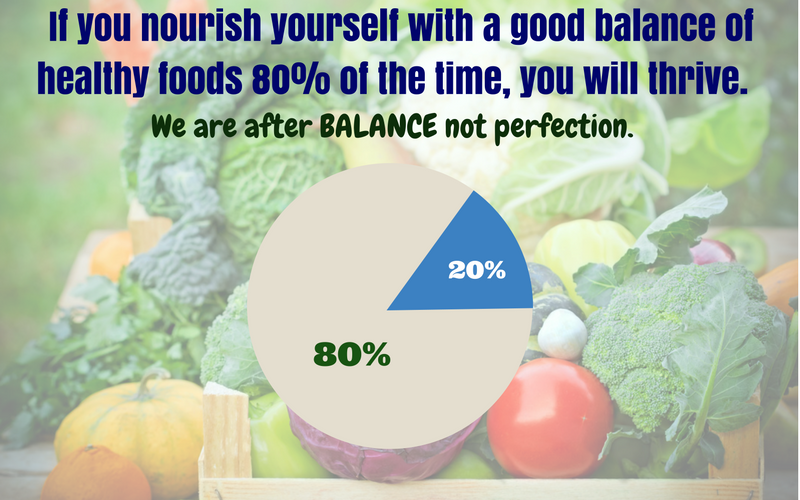 It’s about balance, making healthy food choices most of the time, and allowing reasonable indulgences occasionally. If you are eating a lot of veggies, healthy fats (like olive oil, coconut oil, seeds, nuts and avocados) and good, clean protein (fish, chicken, hormone/anti-biotic free meats, beans) on most days you are meeting your 80%. I enjoy meals like smoothies for breakfast, beautiful salads and rich, delicious soups for lunch, and a dinner consisting mostly of vegetables and a healthy protein. Believe it or not, it takes less effort to make meals using these healthy foods than you may think. In addition to the healthy, delicious foods, there are even indulgences to enjoy within the 80%! For instance, adding a few tablespoons of almond butter to my smoothie is one of my favorite “treats” that adds a level of decadence to my breakfast, and it’s within my 80%. I also take special joy in finding things like beautiful fruit (raspberries are my favorite) on sale that can be so sweet and delicious for topping on breakfast bowls or eating by themselves as a dessert, all included in the 80%. I have one main rule when it comes to my 20%, I always want it to be Worth Every Calorie (WEC)! All too often we are grabbing for whatever may be in the office lunchroom that may not even taste good, but it’s in front of us so we eat it. When I indulge, I like to make sure it is worth the splurge, otherwise I just don’t want it. Things like quality ice-cream, or a wonderful creamy piece of chocolate are WEC. Everyone is different though. I happen to really enjoy quality cheeses and wines. To me, these are WEC. Others will enjoy comfort foods as part of their 20%. Whatever may be WEC to you is what will make up your 20%. Indulging in mindless eating with a bag of chips on the couch watching TV is not part of the 20% because you aren’t really savoring something special. What does 80/20 look like in reality? When I know that I have a function or a special dinner with family coming up (like tonight), I will plan my food for the day to work with my 80/20 Lifestyle. For me that means after I went to the gym this morning I had scrambled eggs with lots of veggies for breakfast. For lunch I made a healthy smoothie. My day, so far, consists of 80% healthy meal choices. For dinner out tonight, I’m going to have this delicious roasted vegetable and quinoa dish. The fancy stuff on top is thinly sliced, roasted parsnips. Doesn’t it look fancy and amazing! This is still within my 80%. My plan for including 20% indulgences is to taste a couple of bites of an appetizer, and a glass of wine. Not only do I feel in control, but I’m also satisfied and not deprived at all. You can eat out and enjoy the healthy 80% and even share a dessert with someone as your 20%. I prefer wine, but you may prefer the cheesecake! Statistics show we make over 200 food choices every day and those choices are the difference between losing weight, regaining vitality, and feeling great, or continuing down a path of low energy, physical symptoms from inflammation, poor sleep, health issues, and limited functionality. The 80/20 Lifestyle is a non-scientific approach to helping you stay on track and assist with weight management. I can help you master the 80/20 Lifestyle, as well as provide other strategies to help you find the time to plan for good foods, and jump start your weight loss, or get you over the hump for the last 10 pounds you may need to lose. To learn more about the 80/20 Lifestyle, sign up for my FREE 30-minute strategy session. Holiday Bonus! Stay tuned for information on my FREE Healthier Holidays Challenge coming soon! It will feature recipes and more tips to help you manage your waistline and boost your energy through the holiday season.